The multimedia work of the Spanish-born artist Javier Martin raises many questions as to the function of art in relation to commercial culture and mass media. At times, the questions put forth in his art may appear difficult to unravel. Even so, his art is not obscure. It goes straight to the point. This could be no more apparent than in his recent series of work, titled Blindness Collection, which appears both eloquent and imposing. It consists of re- photographed black and white images taken of fashion models, but in each case, something has been removed or altered. 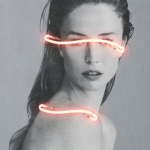 The eyes have been covered with swirls of neon light so they are no longer visible. We cannot read what their eyes are saying just as, hypothetically, they cannot read ours. There is little doubt these “portraits” have been arbitrarily emptied of their humanity through a technique that suggests an inability to see anything outside of the self. They are blinded by neon light, but not in the literal sense. Rather Martin is representing his models in metaphorical terms. We see their faces but not their eyes. Still, there is a lingering seductiveness in the models’ appearances even as they are removed from our ability to wholly decipher them. We do not know exactly how to read these women, Nor do we know how they read us – the viewers. We do not know how they really look or what they might be thinking given the somnambulant gaze that has replaced their original appearance. 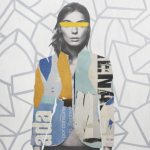 There are ten works in this exhibition, ranging from Martin’s paper collages on painted wood, also replicating images of models taken from magazine ads (2014), to the more recent mixed-media neon collages that comprise the Blindness Collection (2017). Of the latter, each work is given a separate title that carries a poetic angle of vision as to how we might perceive these models. For example, one carries the label Blindness Light Concave Convex while another is Blindness Light Diamond Poetry. They read almost like systemic variations of a fashion cult. A third is Blindness Light Parallel Balance, and a fourth, Blindness Light Porcelain Dream. What do these titles really mean? In each case, the question is raised as to how we might respond in the process of seeing them – what they might evoke in our sensory memory – especially given that the artist has obliterated any eye contact through the application of neon. 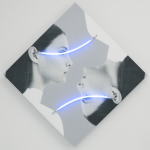 Through this simple, yet profound aesthetic alteration, these transformed female models offer an eerie ambiguity that carries with it a paradoxical point of view. Instead of seeing them for who they are, we stare into their blankness whereupon we become possessed by a certain irony. We turn away from what they see (or what we see) by recognizing the fact that they exist in a world of commercial exploitation. As we gaze from one model to the next, we are blocked from seeing what is truly exemplary or original about the person who has been paid to put her blankness on view. This is an important aspect in Martin’s recent work. 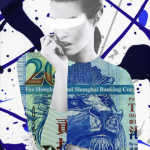 To understand the meaning latent within this exercise in collage and re-photography, one might consider what the artist regards as the “uniform standards of beauty perpetuated by the media.” Martin is clearly concerned with the ambiguities found in commercial culture that obscure the problem. It would appear that meaning instilled within Martin’s Blindness Collection is concerned with how to avoid the absence that perpetually reaches toward cynicism. 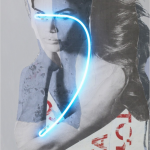 It is interesting to consider that Martin’s neon collage images are focused on observing women isolated from their identity. Here the aura of absence becomes pervasive. 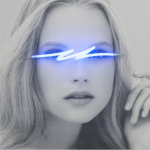 Those left within the frame with neon eyes are blinded by a hyper-mediated culture removed from the indigenous self. Or put another way, they assume the disguise of fakery in order to exist. As a fundamental critique, Martin’s images procure a chain reaction. Images are produced by commercial culture that automatically transform reality into a lassitude that eventually become distraught embodiments of metaphorical blindness. There is nothing beyond the frame in these images other than a defiant narcissism. Martin refers to what he calls “vapid distractions,” which are images prompted by the media that dim “the pure light burning inside each of us.” Clearly he refers to the creative insight that re-invigorates our senses and as it struggles to make itself known as art. This is the basis of restoring sight, which stands in opposition to mindless coercion given to advertisements. 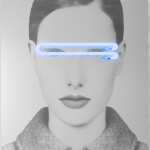 In a statement by the artist, titled “Appropriation of Beauty,” Martin makes clear that “the eyes not only permit the observation of the world but provide a window to see inward, beyond the realm of the physical.” He goes on to say that “the eyes, classically associated with the reflection of human emotions, will always be concealed in his work.” For Martin, the Blindness Collection is critical of those constituents who promote disengagement with culture as the outward reality of human experience. This also refers to what Martin cites as the “uniform standards of beauty perpetuated by the media.” Better known as “perceived perfection,” beauty is consciously conceived as an absolute standard perpetually at the disposal of the media. 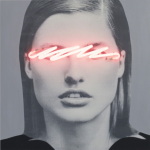 According to Martin, this further suggests that mediated forms of beauty – that is, “beauty” agreed upon by various high- powered agencies – will not and cannot be what artists understand as beauty. For the artist, beauty requires a sense of openness, intuition, and liberation that commercial culture cannot afford to indulge. Therefore, the appearance of repetition is what potential buyers depend on as determined by company specialists that steer the course of marketing. Martin is inclined to accept beauty in art as unconditional. In this sense, beauty is neither determined nor fully conscious as an enterprise. In contrast, it represents an insurmountable reassurance of the human condition less in its despairing moments than in those moments of fulfillment and hope. In fact, this is the essential message of the Blindness Collection. 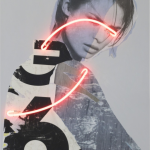 Moreover we cannot deny the irony present in his profound series of re- photographed images enhanced by neon that emerge in the substratum of popular culture. Here we continue to live in a global village where media controls what we already know is mistaken, even as we continue to abide by its conditioning principles. This is the challenge that Javier Martin puts in our path, arguing in favor of alternative ways of seeing ourselves as we come to terms with art in contrast to the seduction of prescribed media.